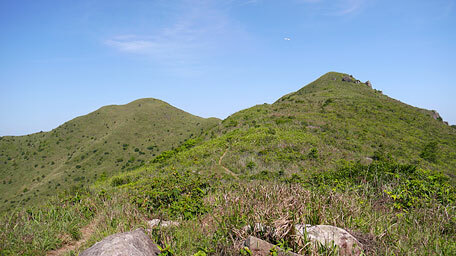 West Buffalo Hill and Buffalo Hill are adjacent, lie between Sha Tin and Sai Kung at 604m and 606m, which range links Shek Nga Shan to form a ring-shaped mountain. 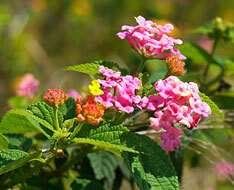 It is slightly physically demanding as there are climbs up and down to a certain extent. 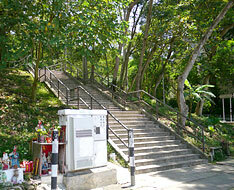 The trail starts from a short flight of steps beside Wong Nai Tau bus terminal. 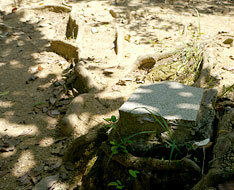 Afterward according to the signpost to Fa Sam Hang, take the left fort along the concrete footpath. 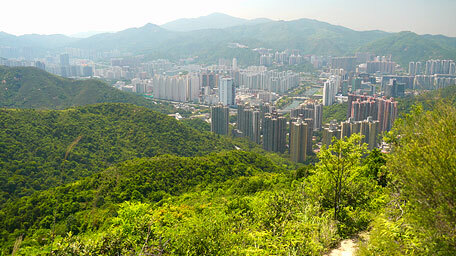 After a gentle ascent, it joins the road at Fa Sam Hang. Follow the road to the right, not far ahead, then take the uphill concrete path on the left. 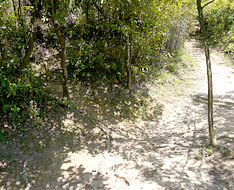 After a few steps, it traces the wooded path on the left at the junction, then leads up to the map board. 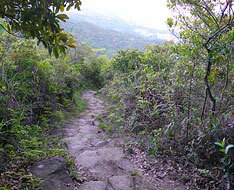 Head the muddy path to Shek Nga Pui on the right, it winds gently up and cuts through the thick woods. Up ahead not far, at a wider left turn, take an obvious uphill side path on the left that climbs up to West Buffalo Hill (pay attention to a ceramic brick on the ground at the junction). The path is steep and narrow but clear. 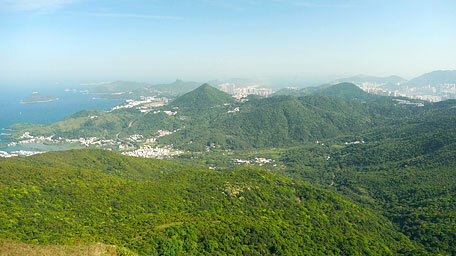 Along it up, you could look back over Sha Tin, farther to Glass Hill, Needle Hill and even Tai Mo Shan as a background. The early summer not coming yet, a few cicadas chirp. Looking far the north valley of Tate's Ridge on the right, the thick verdant woods with distinct gradations of colours across hill stream could be seen. In order to contend for beauty, all trees and plants seem to present their vitality which have been hidden for a long time during the winter. Head the trail, it winds up along the ridge and part of the section is quite steep. Climbing up to the knoll, it becomes gentle. 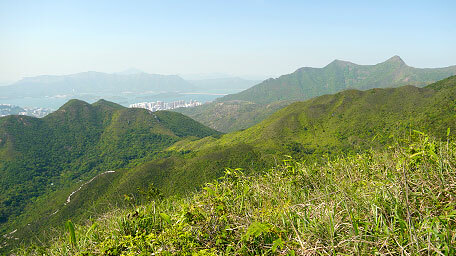 Looking on the left, Ma On Shan like a saddle, and Shek Nga Shan which ridge links up the range of Buffalo Hill, are within the sight. 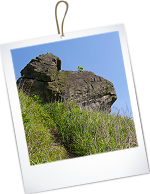 At that time, the summits of West Buffalo Hill and adjacent Buffalo Hill have already been at your front. At the junction on the right, follow the path ahead. Beyond the smooth ridge, it steeply leads up to the hilltop of West Buffalo Hill. 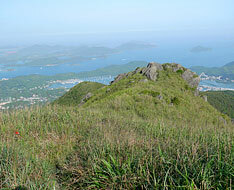 At the top, toward the east, it offers a spendid view over Hebe Haven (Pak Sha Wan) and Port Shelter. 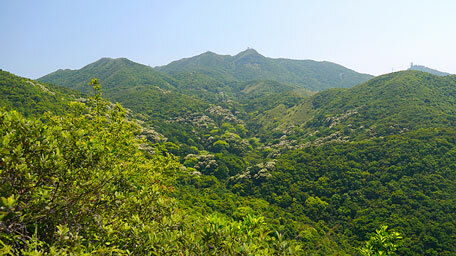 Tung Yeung Shan and farther Kowloon Peak are towering at the south. 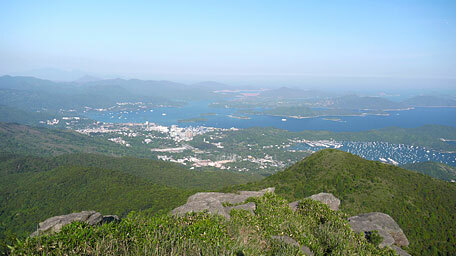 Looking far southeastward, you could see Clear Water Bay Peninsula and High Junk Peak. 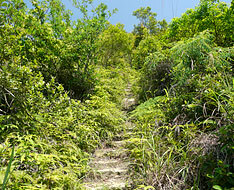 Note: Part of the uphill path is quite steep, it would require to clamber up slightly. 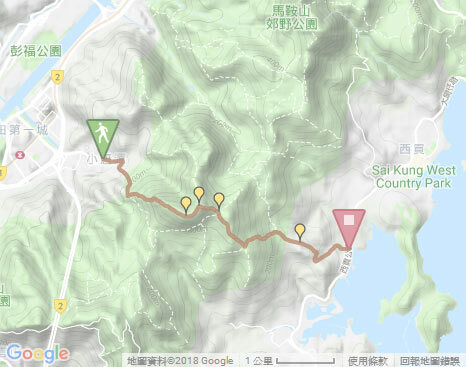 Exit: When climb up to the knoll before ascending to the top of West Buffalo Hill, there is a downhill path on the right leading down to Shek Nga Pui roughly along the southwest slope. Continuing on along the trail ahead, it goes down to the recess then climbs up to the adjacent Buffalo Hill. At the crest, it is amazing by the mighty aura of northern Ma On Shan and Pyramid Hill. The undulated Shek Nga Shan also rolls and billows out. Not far ahead, turn right at the junction to the rocks at the east slope. 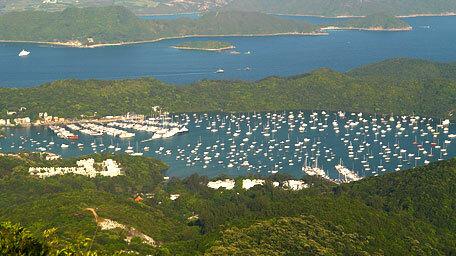 It gives a sublime and panoramic view over Sai Kung. 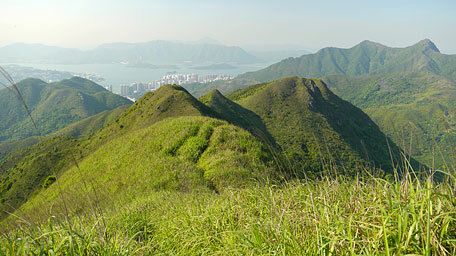 Far to Sharp Peak and High Island Reservoir, near Sharp Island, Inner Port Shelter and Hebe Haven, all feast you eyes. 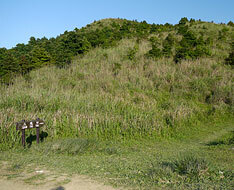 Afterward, follow the downhill path between the rocks at the beginning along the east slope. It is narrow and slightly steep but clear. 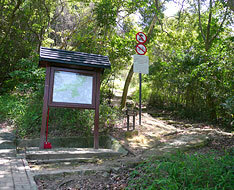 Going down to Fu Yung Pit, it comes to the junction across MacLehose Trail. 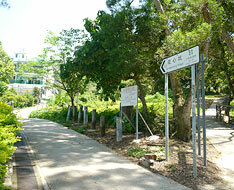 At the junction, take the front path according to the signpost to Sam Fai Tin. 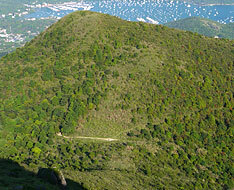 After skirting the hillside of Fu Yung Pit, a grand view on Hebe Haven and Inner Port Shelter could be seen. Down the trail, it cuts through thick woods. 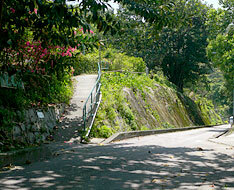 After a flight of stone steps, it leads down to Mang Kung Wo Road, then follows the road to Hiram's Highway in Pak Sha Wan. 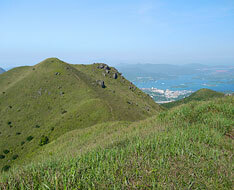 In the azure sky, the sublime scenery over Sai Kung with the indented coastline is like a natural picture. 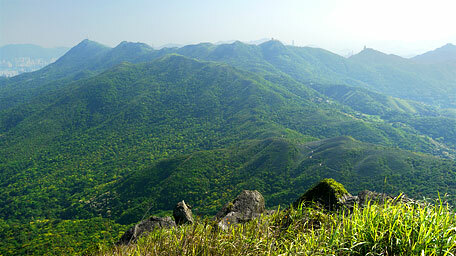 Moreover, being nestled among the rolling peaks of Ma On Shan, Kowloon Peak and Tate's Ridge, I feel myself small.